A walk down Colorado Springs’ downtown lanes will inevitably lead past many locations in which a person can partake in a stiff drink. 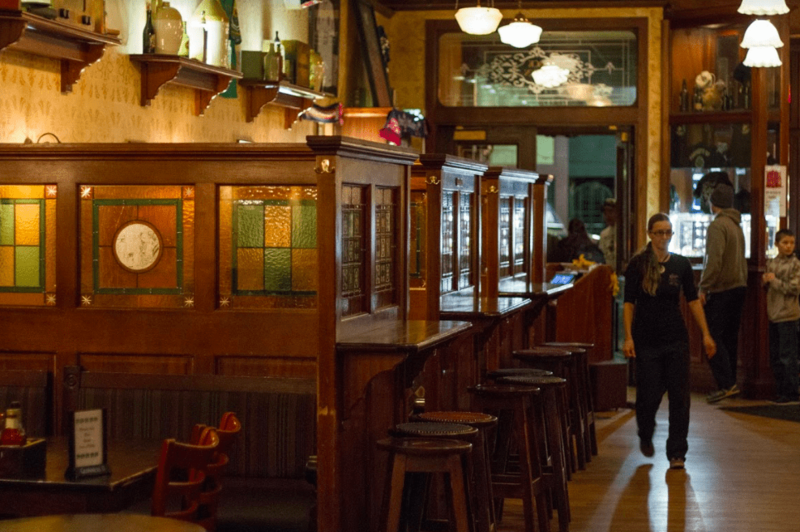 One of the more notable of these locations is Jack Quinn’s, a noticeably busy Irish pub near the corner of Tejon and Colorado Avenue. A walk through the doors, usually following a card check by a bouncer on busier nights, transports one into a distinctly moody environment filled with low lighting and soft music. My first steps through Jack Quinn’s door was met with several observations. The first was the atmosphere. The interior was dimly lit, even compared to the evening light outside. The little that was lit above from yellow low-hung lights was finished off by lamps hung from the walls over wooden tables and chair. An old-fashioned aesthetic is modeled in the décor. Wood and stained glass windows enclosed small cubicles against one wall. The wall behind the bar was topped high with bottles, but was also laden with fireman helmets, an apparent homage and theme. The wooden bar was worn yet clean, with hooks on the front on which patrons could place their jackets or purses. My eyes then followed the walls which held old-fashioned art.. Pictures of 1950’s ale and whiskey advertisements hung on almost every wall, in addition to a number of flags and other fabric works. This rather usual Irish pub scene did not follow when compared to the patronage, at least not initially. For a Tuesday afternoon, the place was filled with families and businessman, not the usual rowdy crowd associated with a pub. Families filled the wooden cubicles, ordering food and soda. Businessmen and women sat at the bar in fine clothes, sipping mixed drinks and discussing business ventures and progress. This changed substantially in the two hours that I spent there. It was almost as though one type of crowd left and another arrived with the setting sun. My final experiences with the place culminated in my experience with their whiskey. My night began with an Irishman Founder’s Reserve, neat. This distinct take on Irish Pot Still Whiskey, 70% single malt and 30% single pot still, has many enjoyable aspects to offer. Hints of cinnamon and vanilla can be found under a strong spice flavor. This spice is even more apparent when sipped, additional flavors of chocolate and caramel can also be found. These flavors must be sought out however, as the bourbon oak is quite strong. The finish is quite smooth and long with a flavor of oak which rests lightly on the tongue. My second whiskey was Warrior whiskey, made by Steamboat. This whiskey is a blend of bourbon and rye. A slow draw of the nose shows a very strong rye scent. Very few things can be found under it due to its pronounced presence, however I found a hint of spice. This particular drink had quite an ethanolic taste unfortunately, a factor which masked other flavors substantially. In fact, the only stronger taste is that of rye. However, it should be noted that the aftertaste is quite smooth, though not very lasting. My third and final whiskey was 2Gingers. My initial observation was the difference in color. It held a distinct golden color as compared to my first two drinks. This change in color shadowed a similar change in smell. Hints of honey, vanilla and fruit can be found under a pleasantly light malt scent. These smells carry into a pleasant experience in the flavor as honey, banana and a light spice become apparent. The finish is equally as delightful as a taste of honey and fruit lies on the tongue for a long time. I would recommend this whiskey above the previous two. Jack Quinn’s offers a very pleasant environment filled with a light atmosphere in which to discover new tastes in strong spirit. The staff are welcoming and willing to answer any questions that might be presented. This alone made my experience at Jack Quinn’s a memory in and of itself. The three whiskeys that I have reviewed above are but a small number that are present on the menu, and I challenge readers (those of age) to discover for themselves the finer details of whiskey.